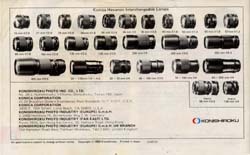 Kindly, Konica Europe GmbH granted me the permission to publish the user's manuals for the Konica SLRs on these internet pages. Thank you to Konica! Just now, the multi-lingual manuals are being scanned. As soon as the scanning is finished, the manuals will be available here as .pdf files for free dowonload. 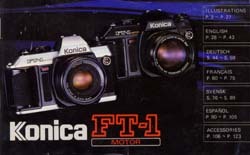 Up to then, you can find some English language manuals for Konica SLRs on Mike Butkus's site.